When seeking Winston-Salem restaurants, you can find examples of almost all the large chains, from steakhouses to international fare to fast-food burger and fries. But if you are willing to get away from the city’s main retail areas, you can find a good range of food choices at moderate prices. There is plenty of traditional American fare from dirt-cheap to surprisingly expensive; southern and comfort food restaurants from cafeteria style to white-table cloth establishments; and a heavy dose of diners. Farm-to-table restaurants that buy local fresh produce from area farms (many organic) are on the rise. Where are the Ethnic and International Flavors? 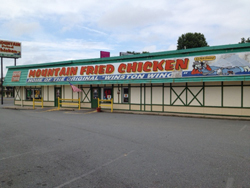 What Winston-Salem lacks is a broad range of ethnic and international flavors. Sure, there is an abundance of Mexican, sushi and Chinese takeout. But if you want Middle Eastern, El Salvadoran, Cuban or Vietnamese, you have about one choice in town. Interested in Korean, Brazilian or African? You’ll need to get in the car and drive to Greensboro or the Triangle. The Winston-Salem restaurant list below should not be considered comprehensive. New restaurants open and close every day, sometimes with little notice. It also does not include national chains – you can find them listed in the phone book or with a quick web search. The list also leaves out hotel restaurants. Again, nothing personal, but if you’re staying in a hotel you’ll know about them. Instead, we tried to focus on the independents or local chains. And in each category, we’ve included a suggested list of best bets based on quality, price, service and value. Recently opened in the former Big Shotz/Lucky 32 spot on Stratford Road and aptly named 5 Points according to its location offers upscale American fare often with a Southern slant. Read our review. 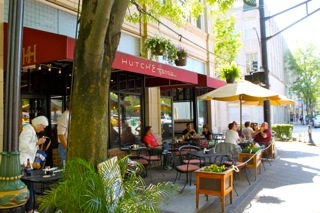 6th & Vine is an eclectic wine bar. 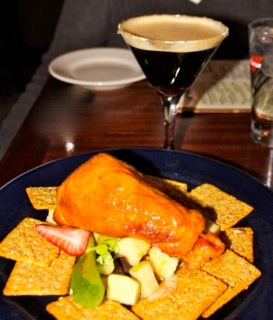 It has a wide wine selection and offers tapas, flat bread pizzas, salmon, steak and ribs. My favorite is their baked brie (pictured) and their fruit and nut salad. Be sure to stay for the live music! 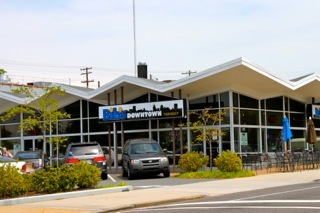 Housed in an architecturally interesting building that was a Firestone auto shop in the ’60’s, Bib’s Downtown sits at the corner of 5th and Spring Streets, Bib’s specializes in barbecue beef, pork, chicken, turkey and sausages all smoked on-site with plenty of yummy side dishes. The finger-lickin’ barbecue and hushpuppies more than make up for the styrofoam plates. Patio seating available in warmer months. Nestled in the heart of the Arts District of Downtown Winston-Salem, Breakfast of Course, Mary’s Gourmet Diner is one of the city’s favorite funky farm-to-table restaurants, focusing on fresh breakfast dishes, often with a twist. Many vegetarian dishes are offered. Hours are Monday-Saturday 8AM-3PM and Sundays 8AM-2PM. Mary’s Diner is only open for dinner the first Friday of each month (Gallery Hop). Enjoy Mary’s eclectic salt and pepper collection and Hello Kitty fetish while you’re there! 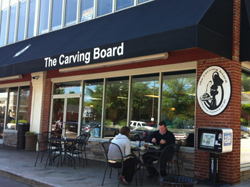 Offering “Creative Cuisine To Go”, The Carving Board is a dependable delicatessen and cafe with a wide range of meats, pasta, salads, made-to-order sandwiches and desserts. There are so many delicious options I can never decide, so I get the “Tri-Salad Plate” for variety. Plates and to-go containers are priced by weight, your bill can add up quickly but the food is delicious every time. A great place to grab a quick lunch downtown. 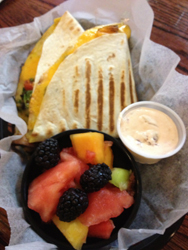 We especially love the sweet potato avocado quesadilla (pictured), the turkey reuben and their burgers! Breakfast served all day at a great price. (Think sweet potato pancakes.) If you have venture downstairs to view the galleries. 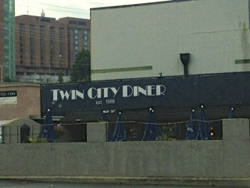 This restaurant is part of a small chain founded in Charlotte, NC in 2000. Introducing the flavors of Colorado to the Carolinas, the restaurant is known as much for its beautiful decor as its great food, with its stonework, hardwoods and open kitchen. We love that it also offers a gluten free menu! 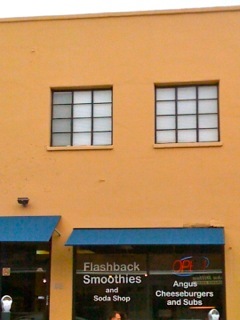 Flashback Smoothies & Grill offers Angus burgers and all-beef, turkey or smoked sausage hot dogs on toasted buns, wings and sub sandwiches, as well as their healthy smoothies, with health supplement options. Too many to choose from? Try the “Marvtastic” berry smoothy, a word coined by Winston-Salem’s annual National Black Theatre Festival’s late founder, Leon Hamlin, combining the words “marvelous” and “fantastic”. 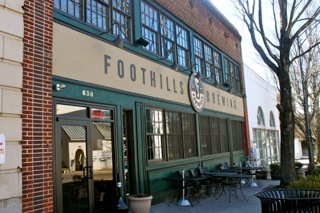 Foothills Brewing is an award-winning handcrafted beer brewery and a restaurant with a menu to compliment those beers. Start with the alehouse shrooms and then try the Brewhouse pork ribs or buffalo burger. Trivia Night every Tuesday & Thursday at 9pm. Reservations accepted. Why put a grocery store on this list? Because the food is good, fresh and fairly inexpensive. Choose from a hot bar with a menu that varies daily, a cold bar, sushi, pizza or gelato, and that’s just to get started. Great location, thoughtful and varied menu, knowledgeable servers and a comfortable but grownup atmosphere. Selections include fish, beef, a traditional chicken pie and vegetarian dishes. The mashed cauliflower is my go-to side dish. 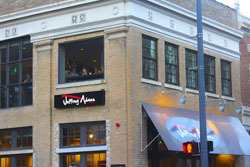 Jeffrey Adams on Fourth is a sister restaurant by the owners of The Old Fourth Street Filling Station just down the street. The food is similar – wood-fired steaks, pasta, seafood and salads, in a more contemporary setting in the center of downtown activity. 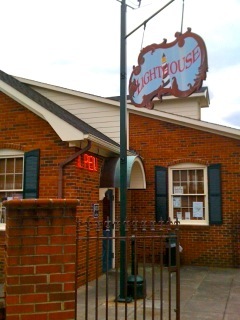 One of Winston-Salem’s oldest diners, the Lighthouse Grill (a.k.a. 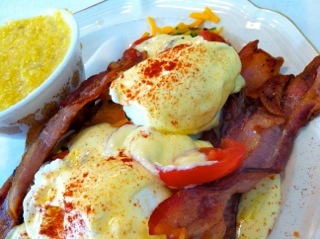 The Lighthouse Restaurant) has been serving up classic diner fare since 1954. Serves up classic diner grub for breakfast, lunch and dinner. Try the Mediterranean salad, the open-faced roast beef or the spaghetti with meaty sauce. Closed weekends. Nestled in the heart of the Arts District of Downtown Winston-Salem, Mary’s Gourmet Diner is one of the city’s favorite funky farm-to-table restaurants, focusing on fresh breakfast dishes, often with a twist. Many vegetarian dishes are offered. Gluten-free breads from Three Sisters Artisan Bakery are often available. Enjoy Mary’s eclectic salt and pepper collection and Hello Kitty fetish while you’re there! A favorite for brunch, Midtown Cafe offers pancakes, omelets, french toast as well as hand-pattied burgers, salads and sandwiches. Dinner options are also available, as well as 25 dessert choices (drool at their cake display). 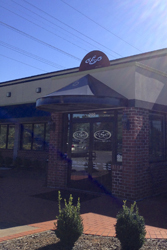 O’So Eats serves lunch and dinner with Southern, Italian and Greek features. We LOVE the delicious nod to Winston-Salem history, the RJR Club: grilled chicken with ham, bacon, American cheese served with honey mustard on a pretzel roll, and don’t forget the sweet potato fries! The Old Fourth Street Filling Station was once just that, an old gas station. Now, it’s a lovely restaurant and bar with a historic feel. Enjoy your lunch, dinner or weekend brunch by the roaring fire when it’s chilly, or out on the patio when it’s nice out. 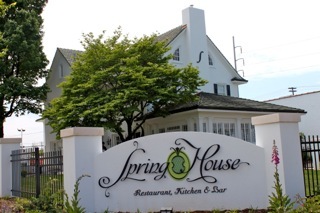 We especially love their Carolina Crab Dip and Fried Green Tomatoes Stack before having their grilled salmon salad. Reservations are accepted but not required. Located in the former location of Mary’s Breakfast of Course, the Screaming Rooster is a fantastic farm-to-table restaurant serving up breakfast and lunch daily, dinner on Friday and Saturday, and Sunday brunch, made with fresh ingredients from local and organic farmers and farmers markets. The restaurant has a French Country theme. Their brioche French toast is a favorite (especially the pumpkin brioche French toast when in season) and worth the $10, as are the local Yellow Wolf Farm brats! Outdoor seating available. People in Winston-Salem aren’t as passionate about hot dogs as they are barbecue, but it’s close. 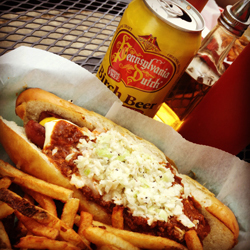 Pulliam’s, Kermit’s, and PB’s Takeout all have great dogs, but it you want something different, try Skippy’s. They serve all beef franks on grilled pretzel rolls with 13 topping options! Previously the estate home of wealthy industrialist, Agnew Hunter Bahnson in the 1920’s, on what was then known as “Millionaire’s Row”, the historic restaurant is located beside the Forsyth County Central Library on N. Spring Street. The restaurant offers a white tablecloth fine dining experience of New American Cuisine with a strong New Southern influence and seasonal cooking by Chef Timothy Grandinetti as well as artisan cocktails at their bar. Look for what the Moravian’s do best – like Moravian chicken pie, pot roast the lunch menu. Menu changes regularly, so check their website. Also a great spot for Sunday Brunch! Be sure to try the gingerbread cake with lemon sorbet for dessert. Ted’s has grown from a dive with a cult following. Stick with the chicken – half birds, quarter birds, sandwiches, wraps or wings. You can get a chopped chicken sandwich with “fixins” for $3.75. Bike night every Thursday. 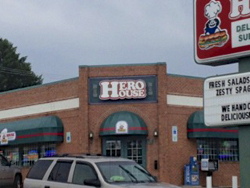 There are two locations for this chain based in Winston-Salem. 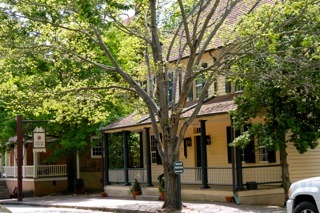 The original Village Tavern located in historic Reynolda Village is a cozy favorite of locals and Wake Forest families. 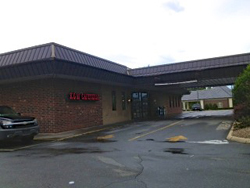 The Griffith Road location, although in the congested mall area, is much larger with lodge atmosphere, and thus, has a shorter wait for tables. The food is reliable with a wide variety of price points and choices ranging from salads, sandwiches and small pizzas to an almost $30 steak. Favorites include the spring rolls, pork chops, and homemade chips with ranch dressing. Gluten-free menu available. 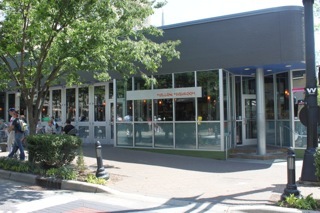 Great outdoor seating at both locations. The menu here is extensive for a wine bar, Vin205 offers lunch and dinner Wednesday through Saturday, wine dinners (check their website for dates) soups, salads, tapas, sandwiches, gourmet pizzas, burgers and desserts and a selection of over 390 wines by the glass and craft and artisan beers on draft and by the bottle. With its pretty little koi pond in front, you can almost forget this casual restaurant is steps from downtown. The café’s specialty is chili, with sandwiches and salads rounding out the lunch menu. The dinner menu expands to also offer surprising culinary delights. With many vegetarian and made-to-order options, you can fill almost any craving here. 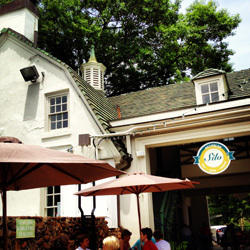 Another of Winston-Salem’s farm-to-table restaurants, Willow’s Bistro serves up fresh, local, organic ingredients from local farmers, as well as fresh seafood. Willow’s Chef Will Kingery is also known for King’s Crab Shack & Oyster Bar on Fourth Street Downtown. Enjoy the art of locals on the walls and the open kitchen while you wait for your food, or dine outside on their patio complete with ceiling fans. They share the parking lot with the Children’s Museum of Winston-Salem, so it’s a convenient stop after a fun day with the kids. Enjoy half-priced bottles of wine on Monday nights and $3 bloody Mary’s and mimosas during Sunday brunch. We love that this deli uses Boar’s Heads premium meats! We love that the Village Tavern has a gluten-free menu! Good selection and wonderful food with offerings far afield from pad thai. Authentic decor, although it is in a strip mall. Service is typically outstanding without being obtrusive. One of the first, if not the first, sushi restaurants in Winston-Salem. Whether you eat at the sushi bar or a table, you’ll enjoy top-quality sushi, although not the most inventive. Any dish on the teriyaki menu will be reasonably affordable and plentiful. Ishi can be difficult to find in its location tucked back off of Stratford Road, but keep looking – it’s worth it. The sushi varieties are more inventive than other sushi places in town, including vegetarian sushi choices. On more than one occasion we’ve spied pepper plants and herbs growing in pots outside the restaurant. The proprietress of Sampan keeps the restaurant dimly lit, which sets a romantic atmosphere but also hides years of wear in the dining room. But compared to most Chinese restaurants in town, it stands out for its beauty. There’s no buffet or sushi, but you’ll find the choices typical of most Chinese restaurants in the U.S. For a different and more satisfying experience, explore the extended authentic menu with its hotpot and casseroles. 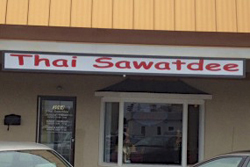 Thai Sawatdee recently opened a second location at 3064 Healy Drive. Let’s hope the new restaurant finds the same magic — food prepared quickly, very fresh, with generous servings and spiciness to order. We love the green curry chicken. If Wen Hwa would just call itself an Asian Fusion restaurant … The décor is gorgeous in this intimate yet affordable restaurant. 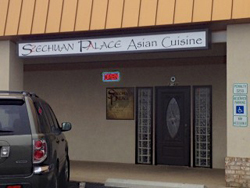 Some of the dishes on the menu are found maybe in only one other restaurant in Winston-Salem. So go for the pho, the lemongrass chicken or the Singapore street noodles, or the Vietnamese black pepper shrimp and chicken. This recently opened contemporary Asian-fusion restaurant features a sushi bar, beef, chicken and seafood dishes and a full-service bar. The food here (Chinese, Japanese, Thai) is great, despite the outward appearance. Sushi rates high, but service doesn’t always live up to the food standards. This Japanese steakhouse gets consistently good reviews for staff, food and sushi. For 20 years, the no-frills Bagel Station has been turning out delicious bagels. 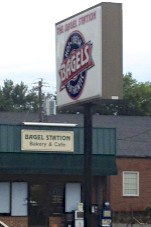 Other stores have come and gone but the Bagel Station survives on its quality, simple menu and friendly service. You’ll find what you need here in terms or bagels and spreads and it’s all extremely fresh. 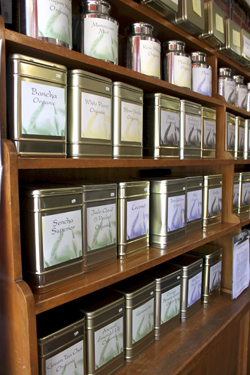 This serene tea and tonic bar has over 90 loose teas available as well as health tonics, but there best-kept secret is perhaps their yummy superfood smoothies and raw chocolate drinks. 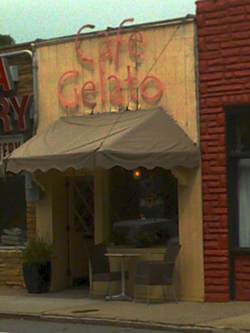 Cafe Gelato is an adorable little gelato shop along “antique row” across from Hanes Park on Reynolda Road serving up fresh handmade gelato and sorbets often with local ingredients. Note that it is only open Thursdays – Sundays. A caffe with European flair, this venue has a lot to offer: wine and beer bar, daily roasted coffees and espresso drinks and baked goods, but they are probably most famous for their daily handmade gelato and sorbets. Camino Bakery is an artisan bakery in the hub of Downtown Winston-Salem that sources most of its ingredients from local and organic farms. Fresh-baked baguettes, almond brioche, cakes, and vegetarian sandwiches are just a few delicacies they serve up with Krankies coffee, beer or wine and they have a mini-grocery of essentials. Each night they offer a La Boheme special: 2 glasses of the featured wine, a demi-baguette, and a piece of gourmet cheese for $11.95. Dewey’s Bakery has been a Winston-Salem tradition since 1930. Notable sweets include their pink lemonade cake in the spring and summer, and with options including cake squares, éclairs and turnovers, there’s something for about any appetite. You can also order birthday and wedding cakes here. 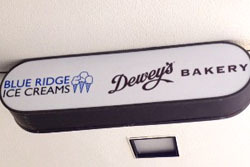 The Thruway Shopping Center location now offers handmade Blue Ridge Ice Creams as well, with signature flavors like Dewey’s pink lemonade cake ice cream with actual chunks of the frosted cake, and Dewey’s Moravian spice cookie dough swirl. 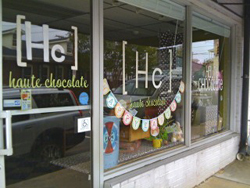 Winston-Salem’s first chocolatier, Jiliana serves up amazing truffles and cupcakes in fun flavors. Krankies roasts their own coffee beans on-site daily in their “warehouse” location and often host music and art events. 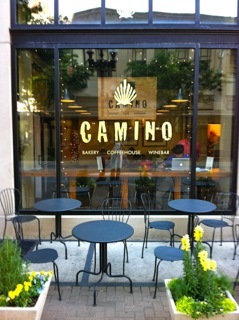 Treats from Camino Bakery are available as well as specialty drinks and beers. 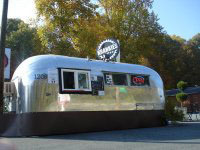 This fun Krankies Airstream offers drive-up service on both sides & their friendly baristas serve up the tastiest cup in town as well as teas, sandwiches & baked goods from Camino Bakery. Can’t go wrong with their lattés. Tip: Bring your own commuter mug to get a regular coffee for only $1.25. Now take a seat at Coffee Park just behind the Krankies Airstream, where you’ll find local goodies to go with that cuppa! We’ll make an exception to focus on independents over chains when it comes to Krispy Kreme, which is headquartered in Winston-Salem. If you’ve only tried Krispy Kremes from a grocery or convenience store, you haven’t had the true doughnut experience. Stop when the “Hot Doughnuts Now” sign is lit to watch behind glass as doughnuts come off a conveyor, float through hot oil and travel through the glazing machine. 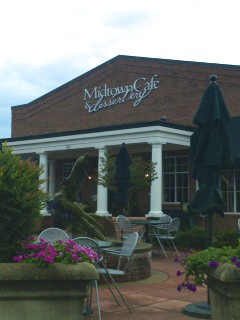 A favorite for brunch, Midtown Cafe also offers 25 dessert choices (drool at their cake display over choices like Italian cream cake, macadamia nut carrot cake and their seasonal 5-flavor poundcake with fresh strawberries. 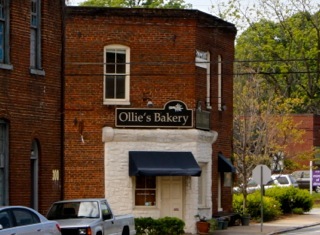 Locals swear by the artisan breads baked at Ollie’s. It is a true bakery, offering breads, pastries and dessert with the freshest ingredients. The selection of breads available depends on the day of the week; go early for the most choices. Ollie’s also offers baking classes. 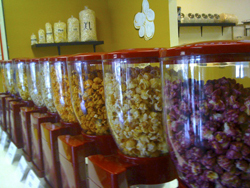 This locally owned popcorn shop gives you a lot of bang for your buck. With over __ flavors on a given day. Popcorn Fanatic offers flavors from sweet to savory with flavors like Dill Pickle, Cinnamon Toast, and my favorite when it’s hot: Chicago Mix. The “candy” flavors come in an array of colors, making a mix of the colors of your favorite Super Bowl team or favors in your wedding colors an easy tasty gift! A visit to Winkler Bakery brings history to life and plenty of mouth-watering choices to fill your tummy. Bakers in period dress explain how the bakery operated when Old Salem was an outpost in the wilderness. Choose from impossibly thin Moravian ginger or sugar cookies, Moravian sugar cakes and breads. You can also pick up packaged mixes of your favorites to bake at home. Part of a tiny chain (mother location in Northport New York), Wolfies is Winston-Salem’s first custard creamery located in the heart of downtown. We’ve never had a custard we didn’t like, but we are partial to the “Southern Sundae”: vanilla custard with pecans, maple syrup and whipped cream! Wolfies also serves up frozen custard cookie sandwiches, custard pies and locally roasted Krankies Coffe. Quite frankly, Lexington is the self-professed “barbecue capital of the world,” so most places in Winston-Salem are trying to keep up. A few are worth a special mention but if you want a slew of choices, head south down U.S. 52 for all that Lexington offers. Specializing in smoked beef, pork, chicken, turkey and sausage with plenty of yummy side dishes. It’s like upscale barbecue compared to many joints in Winston-Salem. Little Richard offers chopped pork, pulled pork and coarse chopped pork in quantities ranging from trays to plates to the pound for to-go orders. The restaurant is known for its tangy “dip,” which is heavy on the vinegar and pepper. Barbecue chicken is also available on the weekends. There’s a second Little Richards at 5353 Gumtree Road. 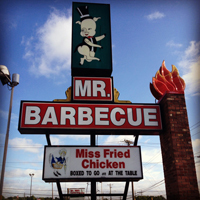 Mr. Barbecue (& Miss Fried Chicken) offer Lexington-style chopped pork, fried chicken and hot dogs. Their hush puppies are considered the best by many. 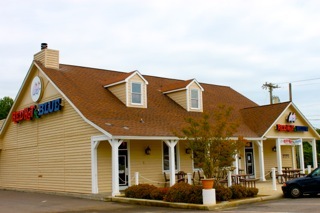 We like their potato salad and selection of homemade pies, banana pudding and peach cobbler. The almost campy Southern atmosphere is worth the trip alone! For the best bet in Winston-Salem, try K&W, a locally owned chain known for its good home-style cooking, and a staff that is quick with the “hons” and “dears.” And they’re sincere when they say them, too. Winston-Salem is far from New York in nearly every way, and that’s not a bad thing. Still, our city still boasts some good delis and sandwich shops. A dependable deli with a wide range of fresh and pasta salads, choice cooked meats, made-to-order sandwiches and desserts. Since the plates are priced by weight, your bill can add up quickly but the food is delicious every time. Not to be confused with their Italian restaurant on Fourth Street in the Steven’s Center, there’s nothing like Dioli’s Italian Market in Winston-Salem. 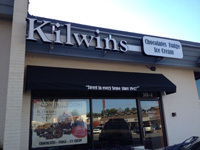 It offers an ample deli, as well as a bakery that uses authentic Italian recipes to create tiramisu, cannoli, sfogiatelle, zeppole and cream puffs. Or choose from coffee cakes, cinnamon roles, turnovers and other delights. The sandwiches at O’Briens’ aren’t cheap, but they sure are big. The deli itself is tiny with only a few tables. But the service is quick so you might as well get your orders to go. People rave about the corned beef sandwiches, the Rueben, and O’Briens’ chicken salad. The Olive Tree is a sandwich shop, not a deli. However, the sandwiches are dirt cheap and high quality. Housed in a former Taco Bell, the flavors are more Greek than American with a menu heavy on gyros, souvlaki and pita sandwiches. 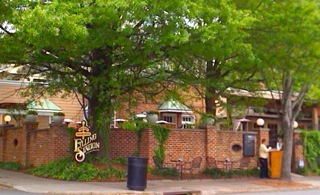 This wonderful dining addition to Reynolda Village is nestled in the old stable area near the silo. Enjoy sandwiches, soups and salads as well as wine and cheese. We especially love the “Parisian Picnic” panini with brie, Granny Smith apples and fig chutney; or try “The Coop” tarragon chicken salad on croissant. Outdoor seating is exceptional! The original Washington Perk location is a favorite hangout, coffee and tea bar, deli and grocery in the Washington Park neighborhood just outside of Downtown Winston-Salem that offers mostly organic groceries, local organic meats and an extensive wine selection. This is one of the few, if not the only deli that offers gluten-free bread. Great deck for enjoying the outdoors. 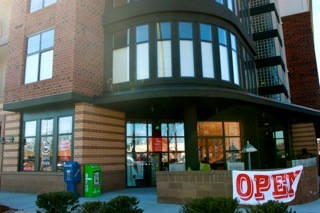 Their second location downtown, “Downtown Perk” offers groceries with local selections, deli and coffee. Gluten free bread available. Fine dining in Winston-Salem doesn’t always mean white tablecloths. It’s a broad category that suggests you’ll feel more comfortable in these establishments if you change out of a t-shirt and shorts. In fact, one restaurant regularly reminds prospective customers that it has a dress code. So bear that in mind when considering this list of “fine dining” restaurants. Bernardin’s recently moved from a tired strip mall into a historic West End home known as the Zevely House, upping the atmosphere. 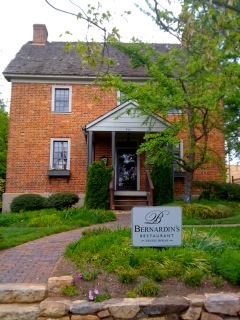 Before the move, Bernardin’s was described in a local newspaper as the Triad region’s only five star restaurant. The dinner menu offers what you’d expect, as well as ostrich and Australian lamb loin. Meals typically run $40 a person with wine. 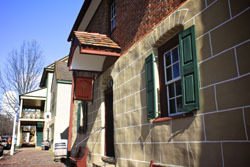 Built in 1815, the historic house was the oldest standing house in the former city of Winston and was moved to its current location in 1974 from Oak Street. 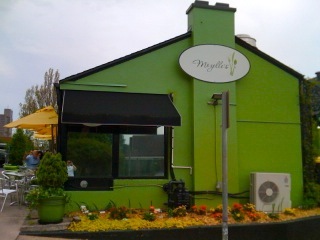 Another of Winston-Salem’s wonderful farm-to-table restaurant, Mozelle’s is a tiny restaurant with a big presence. Serving lunch and dinner, it’s hard to go wrong with any of their Southern-inspired dishes, from Lobster Sloppy Joes to their Pimento Cheeseburger, or my personal favorite, the Tomato Pie (trust me). Great patio seating under cheery yellow umbrellas. Don’t worry, if it’s chilly, they’ll offer you a cozy blanket in their signature green. Reservations recommended for dinner. Noble’s feels like fine dining from the moment you walk through the door. The food is well thought out, the presentation is outstanding and the service is attentive but not snobby. 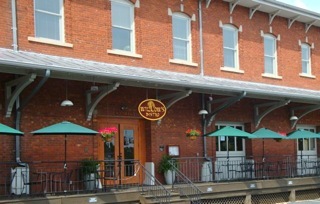 The chef features regional food on his menu in inventive ways. Ryan’s is an old-school choice, from the décor to the menu. That said, the food is consistently good, the portions are plentiful and the service is typically friendly. The dining room windows look out on a wooded landscape. Previously the estate home of wealthy industrialist, Agnew Hunter Bahnson in the 1920’s, on what was then known as “Millionaire’s Row”, the historic restaurant is located beside the Forsyth County Central Library, at 450 N. Spring Street. The restaurant offers a white tablecloth fine dining experience of New American Cuisine with a strong New Southern influence and seasonal cooking by Chef Timothy Grandinetti as well as artisan cocktails at their bar. Sweet Potatoes may have the most buzz of any restaurant that has opened in the arts district. With its focus on upscale southern foods, it’s a comfortable place for lunch as well as a fine dining establishment at dinner time. This restaurant offers views of BB&T’s Wake Forest Field from seven stories up and upscale Southern flavors such as shrimp and grits, angus steak, Cajun catfish and more. Pizzas start at $8, while veal rib chop is $28. Athena is the only semi-upscale Greek restaurant here in town. Here you’ll find saganaki (cheese set aflame in brandy), a yummy kalamari, as well as moussaka, pastitsio, lukaniko and a sampler platter of dishes. They even have some good vegetarian choices. It seemed like Indian was all the rage for a brief moment in the city’s recent history, but that moment passed quickly. What remains are three restaurants, each with their distinctions. 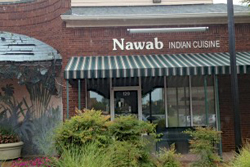 Golden India has a wonderful Indian grocery store that offers fresh produce, and Nawab offers an elegant atmosphere. But many folks give Turmeric first place when it comes to the quality and variety of its menu, which features dishes from the northern and southern regions; the helpfulness and friendliness of its staff; and its overall value. 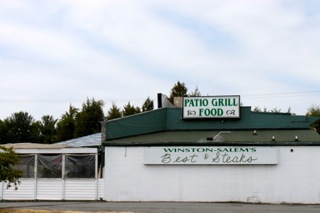 Winston-Salem’s two Irish restaurants are within blocks of each other. Finnegan’s has a good reputation for brunch and as a fun place to hang out as a bar. The Celtic Café is the place to go to hear Irish music. Both places have their loyal fans with favorite dishes, although Finnegan’s appears to have more traditional dishes while the Celtic Café actually offers pizza and wraps. 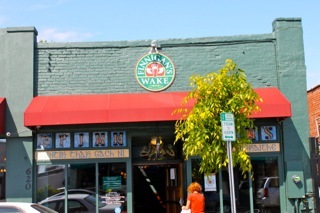 Finnigan’s Wake is a classic Irish Pub and restaurant, complete with dark woods, full bar and Irish fare. 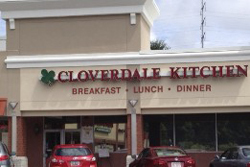 You can’t go wrong with their fish and chips, corned beef and cabbage or Guinness stew. If you’re feeling a little more adventurous, try their Scotch Eggs – hard boiled eggs, wrapped in Irish sausage, then deep fried. Their famous all-day St. Patrick’s Day celebration takes over the entire street for the day with buffet, Irish dancers and bands. Many locals don’t know this place exists even though it’s just off well-traveled Stratford Road. It’s a tiny place, but the food is fantastic, with thick, not-too-sweet, not-too-salty sauces, a wide selection of pasta dishes with veal or chicken, and the usual strombolis, calzones and pizza. 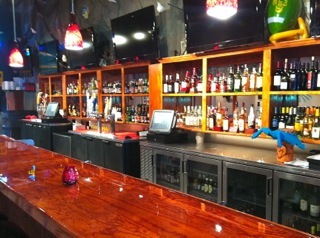 The prices may seem a little high for the atmosphere, which is laid back and friendly. But the food is worth it. Located in the heart of downtown in the Steven’s Center, Dioli’s serves authentic Italian, offering a convenient lunch buffet while offering fine wines, small plates, pastas, seafood, veal, chicken and pork entrees for dinner. Finish off your meal with tiramisu, cannoli or Italian cream-filled puffs. 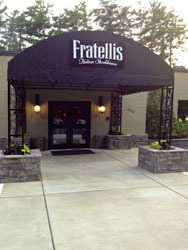 Francesco’s also has a location off of Jonestown Road which was previously called Franco’s. What does Francesco’s do right at two locations? Well, the food is extremely fresh, the portions are large and the prices are reasonable. They know Italian food – the co-owner grew up in Naples. Full breakfast menu and coffee bar serving locally roasted Krankies coffee with fresh baked goods from Dioli’s Italian Bakery, paninis and salads for lunch and a wide tapas and entree selection for dinner. With the closing of two restaurants in the last year, this category is noticeably thin. 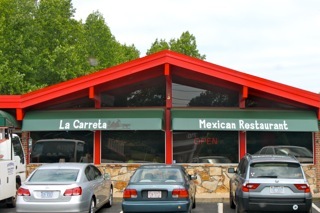 1527 S. Martin Luther King Dr.
For many years, the only choices for Mexican food in Winston-Salem were at restaurants so fully Americanized you were lucky to find a jalapeno, never mind a habanero. But luckily the city’s growing Latin population has helped bring more flavor and authenticity to town. Here are some recommendations. The food critic for the local paper loves La Botana for its authenticity and inventiveness. The chef is always changing up the menu, which also features outstanding regional and traditional dishes. The only downside is its location in a non-descript strip mall, but the food and service will make you feel miles away. Las Estrellas is in a former Pizza Hut, but don’t let that dissuade you from giving it a try. They have an extensive list of seafood dishes, including fish tacos and a seven-seafood soup. For a cheap meal, ask for the Mexican tacos – just chicken or beef, cilantro, a dusting of Mexican cheese and some chopped onions, all in a soft, homemade tortilla. We mention El Triunfo not because it’s great but because it’s different. It may be the only Salvadoran restaurant in town. You’ll find a menu with excellent pupusas and plantains on the side. A more upscale Mexican restaurant than its mothership, Las Estrellas, Señor Bravo, located in the former South by Southwest location, offers a finer Mexican dining experience, with tablecloths, a bar, and colorful decor, but don’t worry, they still have soccer playing on all the televisions. Guadalajara’s dining room appears to have two well-divided sides – one for the Americanos and families, and the other for groups looking for a good time. On the family side, you can expect the waitresses to kiss any baby in the room and make sure your every need is met. Try the tortas (sandwiches), which are piled high, as well as the pozole. Also, you’ll receive several different kinds of salsas as well as pico de gallo, all spicier than the next. One benefit of having more Northern transplants in the area is that the quality of pizza available in Winston-Salem has greatly improved in recent years. You can find traditional New York style pizza, gourmet pies with fancy toppings, and a range of options when it comes to crusts. We’ve included three small North Carolina or regional chains on this list: Brixx, Mario’s and The Loop. Big, New York-style slices. Order them individually or by the pie: try Voodoo Chicken Pizza for a little kick, or my personal favorite, Chicken Pesto Pizza. Wings, salads, subs and some killer garlic knots are also available. The funky location on Burke Street is a great place to people watch in the afternoons or evenings, and a popular spot with the late-night crowd. 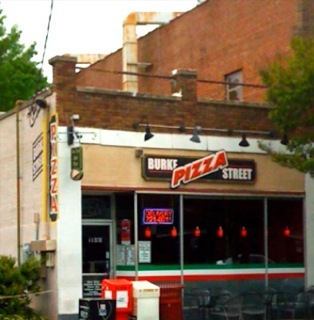 Burke Street opened a second location in the Robinhood Road area with a larger dining area and is making plans to open a third location in Greensboro soon. Mario’s Pizza leads to cravings that nothing but Mario’s can satisfy. The cheese is generous and the crust is thin and chewy. To eat a slice neatly, you must fold it in half and be prepared for the possibility that a little grease and sauce might end up in your lap. You can buy a whole pizza or just a slice, and the salads with the house dressing are tasty too. Mellow Mushroom is part of the funky pizzeria chain, located in the center of it all downtown. The multimedia mosaic walls are the handiwork of local artist Millicent Greason. Offers gluten-free pizza crust, vegetarian and vegan options. 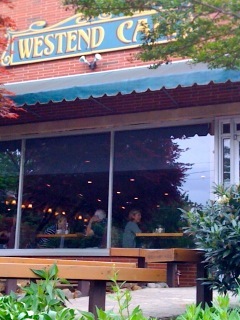 Take a seat on their mod patio and outdoor seating for great people watching on Fourth Street. The seafood is really fresh and the prices are reasonable. Plus it’s one of the few places in town with a shrimp burger, as well as an oyster burger and a soft-shell crab burger, on its menu. Those are reasons enough to give it a try. 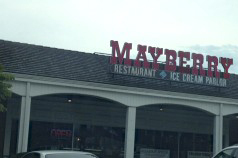 Mayflower is a North Carolina-based chain of restaurants. We mention it here because when the restaurant on Peters Creek Parkway burned down a few years ago, more than a few loyal customers went into deep mourning. 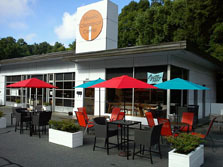 A rebuilt restaurant opened in 2009 in the same location. Most of the fish dishes on the menu are fried – expect to wait 20 minutes for a broiled order (according to the menu). 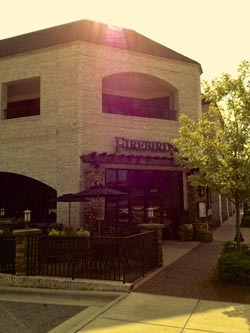 Great bar atmosphere and outdoor patio for casual dining. Order the Dreamy Steamy Bucket for two and you are sure to feed 3-4 people with steamed crab legs, mussels, clams, shrimp and more! It seems almost wrong to put Sweet Potatoes on this list because the restaurant describes itself as serving Southern food, and the atmosphere is more fine dining than funky. But the menu includes dishes with ingredients such as collard greens, fried okra and dirty rice, so maybe it qualifies. Southern restaurants have found their footing in recent years as people search out the tastes and memories of the meals their mamas and grandmas used to make. Or maybe Southern food has become trendy. Whatever the case, these three recommendations all offer a good meal at a similar price. Why not try them all? Recently opened in the former Big Shotz/Lucky 32 spot on Stratford Road and aptly named 5 Points according to its location offers upscale American fare often with a Southern slant. Milner’s offers some great tasting Southern food but brings it upscale in presentation and taste, playing down the salt and playing up the freshness. There are so many good choices to try, including the frogmore stew, buttermilk fried chicken with collard greens, and tomato and summer squash cobbler. The chef really knows the menu and is quick to substitute for food allergies or other special concerns. You can dine outside at Mozelle’s, and the staff thoughtfully places light blankets on the chairs on chilly nights so patrons can cover up if needed. Inside the restaurant, space is tight with a view of the open kitchen. For appetizers, try the fried pickles with honey mustard or the southern spring rolls; for dinner, consider a tomato pie or the gourmet meatloaf. Putter’s is a place where you can feel comfortable in flip flops and an untucked shirt. The atmosphere is more sports bar than fine dining, but word has it they prepare a great steak at an extremely reasonable price. It’s a popular spot with Wake Forest students, fans and alumni. I cannot think of any full service restaurants in that area that allow dogs (not to say that there aren’t any but I just do not know of any off the top of my head). 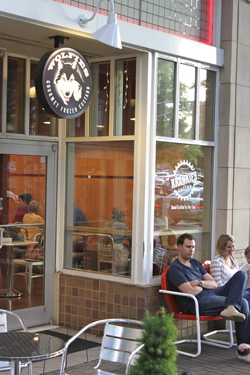 However, there are many quick service options with outdoor seating where dogs would be welcome including: Chipotle (right off the I-40 Hanes Mall exit), Qdoba (Hanes Mall), Panera Bread (Hanes Mall). Hope that helps! Hi to your pup! I’ll let Kristi respond to the Dr. J question. 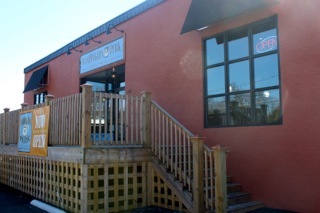 Ardmore Coffee is now open where Cafe Roche used to be, and we love it so far! Thanks, first of all, for compiling this list. I wanted to try Dr. J's, but one site said it had closed, and another restaurant, "Rumba Café" (serving, from what I could gather, various Latin-American stuff) was listed as having the same address. When I called Dr. J's number, I got no answer. Can anyone verify? Also, there's a "new" café now open where Roche was…don't know anything else about it. Thanks again! Sorry to hear about Turmeric! 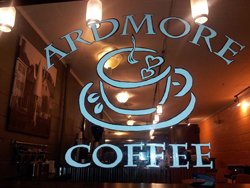 I do have some good news however; Ardmore Coffee (run by the owner's of Carlile's pub next door) has opened in the old Cafe Roche location. We tried it and loved the new decor and coffee. They've got cool cement slabs jutting out of the wall as tables, and completely redid the inside (paint, bar, decor, etc.). Curious to hear what you think! Thanks for your inquiry Always on a Restaurant Quest! You are correct. Dr. J's House of Soul Food has closed and Rumba Cafe is now located at that address. 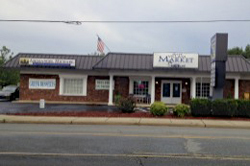 We did receive an answer to our call to (336) 293-4266. Their hours are 11am-9pm Sunday -Thursday and 11am-2am Friday and Saturday. And yes, Ardmore Cafe just opened in the Cafe Roche location. We will update our list accordingly. Thanks! Noted! Sad about both. Thanks Amanda! Thanks for the info Lori! We have updated the post! Could you please add our telephone number to our listing? It is 336-722-1227. Our menu changes every 3 months and we post it on our web site. Our Sunday Brunch menu changes every week…no two Sundays are alike. WE HAVE NEVER SERVED SAUERKRAUT STEW….however we do make all of our own sauerkraut from organic cabbages ( they ferment better!! ). So glad you had a great trip! Adding Dr. J's to our list to revisit soon! Thanks, we greatly appreciate the feedback and plan to make it even better! 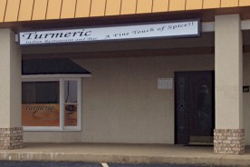 Turmeric was my favorite Indian restaurant but alas they have closed. Also I'm pretty sure Cafe Roche is closed as well. I like to read various web resources and today i came across your site. I believe it is one of the best blogs available for Winston Salem! Well done. 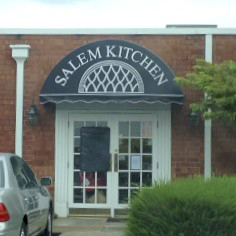 My spouse and I just recently visited Salem, and I came across your website while searching for things to do in Winston Salem, and this restaurant guide helped us out so much when it came to our meals! One of our favorite’s was Dr. J’s soul food, the staff was so friendly and treated us like we were locals, plus the food was to die for! I just had to come back here and thank you for sharing this, made our trip what it was!